I’m still processing our Mount Washington hike. And I am increasingly struck by how little I actually want to go “real” rock climbing, which our present idea for a next adventure – The Grand Teton – seems to offer in abundance. I’m currently reading To the Last Breath – A Memoir of Going to Extremes by Francis Slakey. It starts off with him and a climbing partner sleeping on a ledge on the face of El Capitan in Yosemite – roped, of course – only to have the webbing that held their “cot” fray and plummet out from under them some 2000 feet down. Not for me. But in contrast, somehow the idea of a 14 hour night into day slogging up and down a glacier on a volcanic mountain – even with the incumbent risk of avalanche, crevasses, and a slip that could turn into a never-ending tumble down – doesn’t read the same way to me. I’m not sure I can articulate why a sheer granite wall feels so different than an expanse of deep white, but it does. Perhaps the glacier seems something that simple determination can conquer; the other requires more innate physical ability and guts. Whatever the case, all I can say is that narrowing our focus to a trip in June or July of 2015 to Cotopaxi, the second highest mountain in Ecuador, with acclimatization hikes up Guagua Pichincha (15,696 feet) and Illiniza Norte (16,818 feet), is reinvigorating my training. Today, having narrowly managed to dodge the paper avalanche currently threatened by thousands of documents on my desk, I climbed stairs for over an hour – seven times up and down my building. Cotopaxi will be at least as hard as Elbrus, and there will be a sufficient amount of scrambling, especially, I think, on Illiniza Norte, to satisfy any inchoate desire to climb up a pile of rocks. 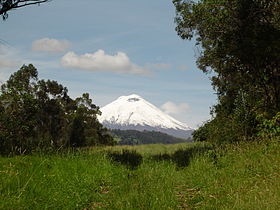 Cotopaxi is 19,348 feet, 7 feet higher than Kilimanjaro and about 800 feet higher than Elbrus. Every time I have climbed a mountain I have always felt if I had a do-over I’d do it better the next time. But you don’t go backwards to a mountain. You just find a new one. Indeed. No do-overs. Find a new one! I ❤ this. BTW, you will forget the rocks in 6 months until they are crunching under your feet, and then you'll say (when its far too late to go back): "What was I thinking?" It’s a little daunting – maybe I should try a CrossFit workout!